On a tour of Tsitsikamma National Park, walk through an 800-year-old forest of endemic yellowwood trees, explore diverse coastlines, and hit the array of hiking trails. Spend the 3rd (Thu) exploring nature at Tsitsikamma National Park. There's lots more to do: hike along Otter Trail, tour the pleasant surroundings at Waterfall Trail, don't miss a visit to Tsitsikamma Forest’s Big Tree, and push the limits with an extreme tour. To find reviews, traveler tips, ratings, and other tourist information, go to the Tsitsikamma National Park travel itinerary planner. Pamplemousses, Mauritius to Tsitsikamma National Park is an approximately 15-hour flight. The time zone difference moving from Mauritius Time (MUT) to South Africa Standard Time (SAST) is minus 2 hours. In August, Tsitsikamma National Park is slightly colder than Pamplemousses - with highs of 22°C and lows of 13°C. Cap off your sightseeing on the 6th (Sun) early enough to go by car to Plettenberg Bay. On the 6th (Sun), look for all kinds of wild species at Birds of Eden and then identify plant and animal life at Monkeyland Primate Sanctuary. Keep things going the next day: head outdoors with Tenikwa Wildlife Awareness Centre, do a tasting at Plettenvale Wines, then look for all kinds of wild species at Robberg Nature Reserve, and finally contemplate the long history of Nelson Bay Cave. To find photos, maps, where to stay, and tourist information, read our Plettenberg Bay trip itinerary planner. Traveling by car from Tsitsikamma National Park to Plettenberg Bay takes an hour. Alternatively, you can take a bus. In August, plan for daily highs up to 22°C, and evening lows to 13°C. On the 8th (Tue), you'll travel to Knysna. Start off your visit on the 8th (Tue): head outdoors with Knysna Elephant Park, then explore the striking landscape at Knysna Heads, then stop by Eye Love, and finally look for gifts at Garden Route Export House. Get ready for a full day of sightseeing on the next day: stroll through Buffalo Bay and then identify plant and animal life at Featherbed Nature Reserve. To see other places to visit, more things to do, traveler tips, and other tourist information, read our Knysna online itinerary creator. Knysna is just a short distance from Plettenberg Bay. 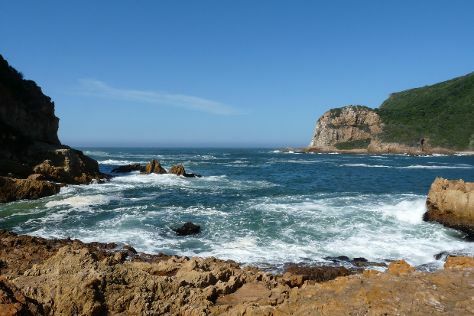 In August, daytime highs in Knysna are 22°C, while nighttime lows are 13°C. You'll set off for Wilderness on the 10th (Thu). Kids will enjoy Wilderness Beach and Acrobranch Wildwoods. Spend the 10th (Thu) exploring nature at Wilderness National Park. There's still lots to do: explore the activities along Wilderness Lagoon, get great views at Dolphin Point Lookout, view the masterpieces at Pharoah Art Gallery, and scramble along the landscape with a canyoning and rapelling tour. To find reviews, other places to visit, photos, and more tourist information, read Wilderness trip planner. You can drive from Knysna to Wilderness in an hour. Alternatively, you can take a bus. Expect a bit cooler evenings in Wilderness when traveling from Knysna in August, with lows around 9°C. Cap off your sightseeing on the 14th (Mon) early enough to go by car to Mossel Bay. 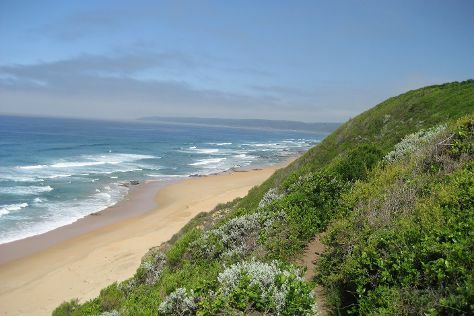 A popular stopover on South Africa's famous Garden Route, Mossel Bay charms tourists with its picturesque sandy shore that stretches along the Indian Ocean, and its pleasant, mild climate. On the 14th (Mon), stroll through St. Blaize Trail and then meet some fierce fish with a shark diving experience. Get ready for a full day of sightseeing on the next day: play a few rounds at Pinnacle Point Beach and Golf Resort and then enjoy the sand and surf at Santos beach. 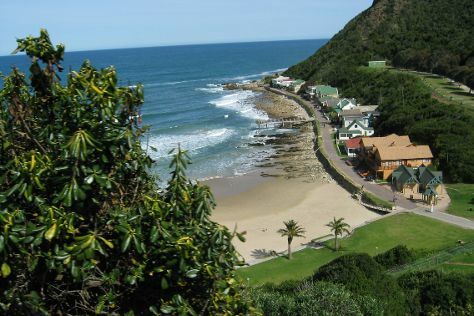 To find maps, reviews, traveler tips, and more tourist information, read Mossel Bay trip itinerary planner. Getting from Wilderness to Mossel Bay by car takes about an hour. Other options: take a bus. Plan for somewhat warmer nights when traveling from Wilderness in August since evenings lows in Mossel Bay dip to 13°C. Wrap up your sightseeing on the 16th (Wed) to allow time to drive to George. On the 16th (Wed), examine the collection at Outeniqua Transport Museum, then experience rural life at Redberry Farm, and then identify plant and animal life at Zorgfontein Game Farm. Here are some ideas for day two: contemplate the waterfront views at Victoria Bay and then see exotic creatures in open habitats at a safari tour. To see more things to do, traveler tips, and more tourist information, refer to the George holiday planner. George is just a stone's throw from Mossel Bay. Traveling from Mossel Bay in August, plan for little chillier nights in George, with lows around 9°C. Finish your sightseeing early on the 18th (Fri) so you can take a bus to Oudtshoorn. You've now added Cali Craft & Gems to your itinerary. Kick off your visit on the 18th (Fri): experience rural life at Safari Ostrich Show Farm, then stop by Cali Craft & Gems, and then look for gifts at Lugro Ostrich Leather Products. On your second day here, look for gifts at La Chocolaterie Rococo, then look for all kinds of wild species at Cango Wildlife Ranch, and then explore the fascinating underground world of The Cango Caves. For other places to visit, more things to do, reviews, and other tourist information, go to the Oudtshoorn vacation planner. Getting from George to Oudtshoorn by bus takes about an hour. Other options: drive. Wrap up your sightseeing on the 19th (Sat) early enough to travel back home.